Apart from the Turkey situation, the Brexit issue will influence GBPUSD. Today Claimant Count Change and Unemployment Rate will be released in the UK and the US will publish Import and Export Prices MoM. 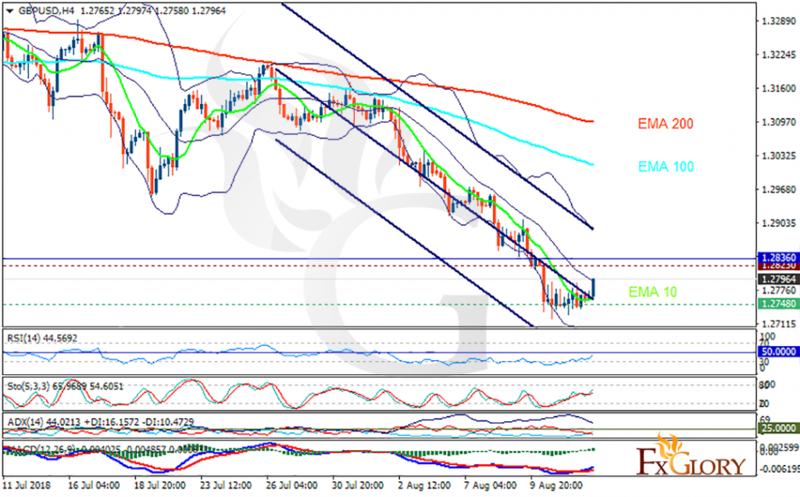 The support rests at 1.27480 with resistance at 1.28230 which both lines are below the weekly pivot point at 1.28360. The EMA of 10 is moving with bearish bias in the descendant channel and it is below the EMA of 200 and the EMA of 100. The RSI is rising towards the 50 level, the Stochastic is showing upward momentum and the MACD line is above the signal line in the positive territory. The ADX is showing buy signal. The resistance level breakout will push the price up towards 1.30; otherwise the price will drop to 1.27.